Lettuce wraps are Asian, right? Those PF Change guys make one that people seem to like. I love Asian flavors, but giving you a new take on an Asian dish isn’t at the top of my current skill set. So I went a new route, and put in some of my favorite flavors that also happen to be (mostly) healthy. Let’s talk about that PF Chang wrap. It’s listed as an appetizer that has 4 “servings,” but if you eat it as an entrée, it’ll feed one. As a entrée it has close to 600 calories, 2600 milligrams sodium (!!! ), and 47 grams of carbs (I don’t even get bread!). Just as a comparison, an In-N-Out cheeseburger with ketchup has 400 calories, 1080 milligrams sodium and 41 grams carbs. I’m not trying to dissuade you from eating them, they look delicious, and if you want to order it, you should do that. More or less, I’m trying to get you excited about these lettuce wrap because it’s just as delicious and the numbers are amazing. It actually qualifies as diet food, even with the goat cheese and chicken thighs. It has only 255 calories for a generous serving, 650 milligrams sodium, and only 6 grams of carbs! Plus 24 grams protein and some fabulous vitamin C from those strawberries. And it only takes 20 minutes! If you want to make them ahead for lunch (you should!) just store the chicken, strawberry salsa, cheese and lettuce all separate and assemble at lunch time. Because interactive lunch is more fun. In small bowl combine the pepper, cornstarch, chili powder, salt, brown sugar and garlic powder. Chop the chicken thighs, removing any large pieces of fat. Toss the chicken in the spice mixture until well coated. Heat the olive oil over medium high heat until hot but not smoking. Add the chicken, sauté until cooked through, about 5-8 minutes. In a small bowl add the strawberries, red onions, cilantro, jalapeno, and lemon juice, toss to combine. 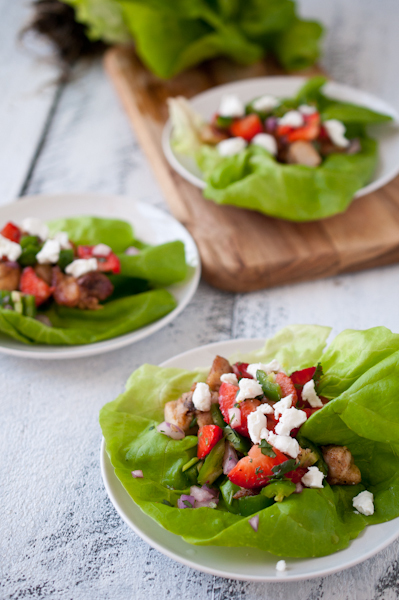 Fill butter lettuce leaves with chicken, strawberry mixture and top with goat cheese. I had heard so many great things about PF Changs, and when we were at Disney last year, I finally caved and agreed to eat there… let’s just say it was a one time only kind of experience. 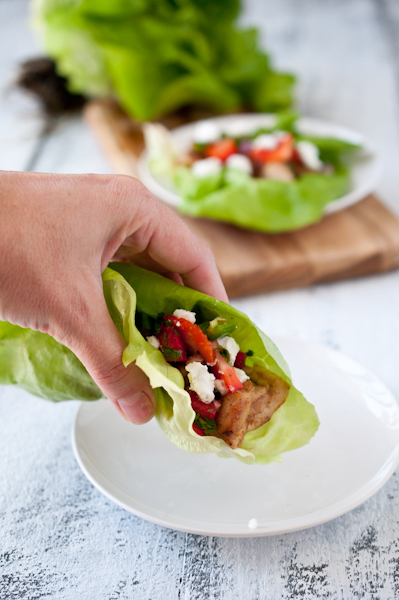 However, lettuce wraps like these gorgeous ones you made, well – I could eat them everyday! I’ve actually never been to PF Changs, but so many people make “copy cat” versions of those wraps. You know how it is in fantastic food cities, like the ones you and I live in, there are just so many other one of a kind place to eat. Chain restaurants almost never enter my mind, I’m sure you’re the same way. I thought I was the only person in the world whom had never had a PF Chang’s lettuce wrap…now I know why we are friends! And I am so making these because I am trying to cut down on carbs and this looks like an AMAZING way to do it. And I pretty much have all that stuff! Even if this is diet food, it looks great!! 🙂 Want!! Whoa!! I am never eating at PF Changs again and switching up to only eating In n’ Out 😉 Seriously Changs is kinda fake and pricey, In n’ Out is way better priced and lower sodium…winner! Pinned that baby!! looks delicious! 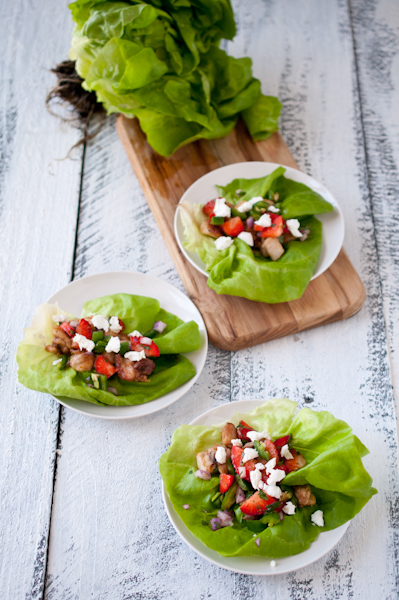 I love the flavors in these lettuce wraps, absolutely fantastic! They look delicious! I have always been a huge fan of lettuce wraps! I love your ingredients, so fresh and SO delicious! Love these lettuce wraps, great flavors! Gorgeous photos too! Oooooh I love the addition of fruit in these wraps! Great blog! 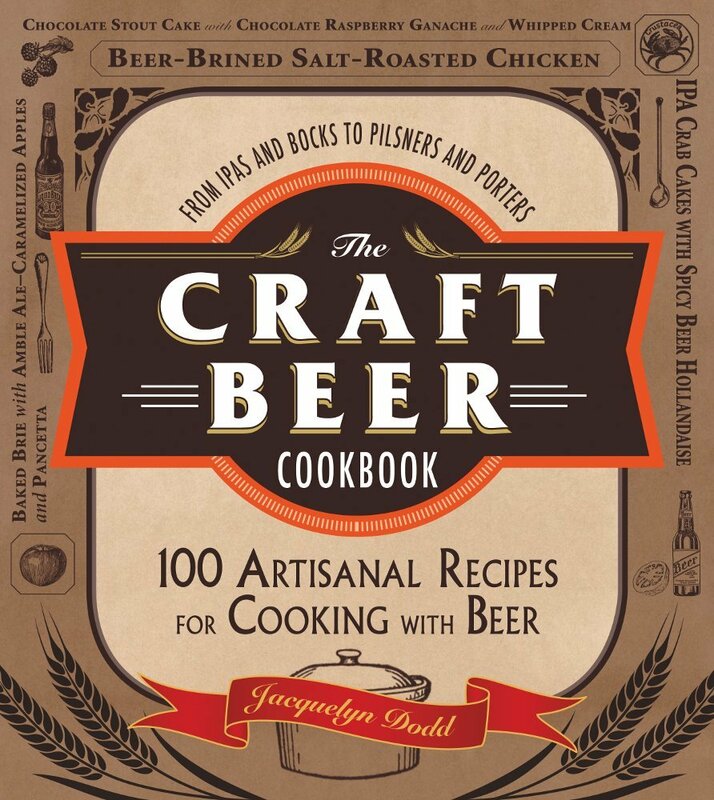 I’m looking forward to making some of your recipes.